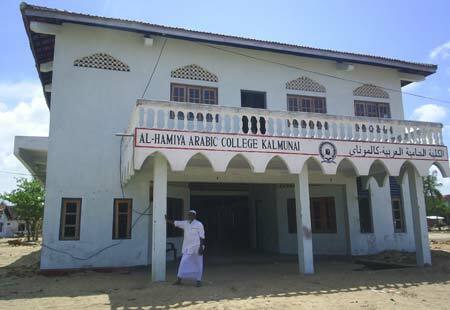 Al-Hamiya Arabic College, a leading senior Arabic College in the Ampara district, started more than a quarter of a century back in 1979 for the sole purpose of educating the youth of this region in the knowledge of Koran and Hadith in its purest form, is located along the Rest House Road, Kalmunai .The campus of this college is surrounded on the North by the old Rest House occupied by the armed forces of the Srilankan government and the sea, South by the Hamiya lane leading to Islamabad village, West by the Rest House road leading to the sea, and East by Islamabadh village separated by a road. The College Complex as at the material date consisted of an area of 6 ½ acres consisting of King Feisal Foundation lecture hall, a storied mosque, an administrative block, junior hostel block, kitchen complex with the dining hall and the store room, Lecturer's quarters, Library and a computer room. The Governing body of this College is The Kalmunai Himayathul Islam Movement,a body incorporated by an act of Parliament No. 29 of 1992. This organization was formed in the year 1997 by a group of learned pious elders of the Kalmunai region in order to eradicate un-Islamic beliefs and practices (Bidath and shirk) that were prevalent among the people of this region. As its maiden venture Al-Hamiya Arabic College was established in 1979 to achieve this goal. This Institution was started with 30 students in a building belonging to a member of this organization. Al-hamdulillah in the years following with the help of the people of the region and with aid from philanthropists both from within the country and abroad the College grew to the present position it occupied before the disaster struck. The Institution in the past had faced many calamities both man made and otherwise. Al-Hamdulillah it had survived all such disasters and came out with flying colours. With the help of the Almighty the College has produced well over 150 moulavis and many of them have obtained degrees from various Universities of Sri Lanka. Many of the moulavis are leading an exemplary life and doing yeoman service to the people of the area. It was a fine cool Sunday morning when disaster struck. Students numbering 110 with the staff strength of 10 were having their usual morning classes not knowing what was going to happen to them little later. Around 8.45 am on the 26th of December 2004 all of a sudden they saw giant massive waves racing towards them destroying all that were in front of them. They had hardly any time to take any action except to race towards the first floor of the lecture hall. Within seconds water level rose to the first floor level. They could do very little except to pray and make dua. Everybody thought that it was their end. Praise be to the Almighty in a few moments the waves receded and took away all that were in their way right into the sea. What was the after math? Nothing was left intact. All that were in the path of the tidal waves were washed away. The scene was so horrible and unsightly. 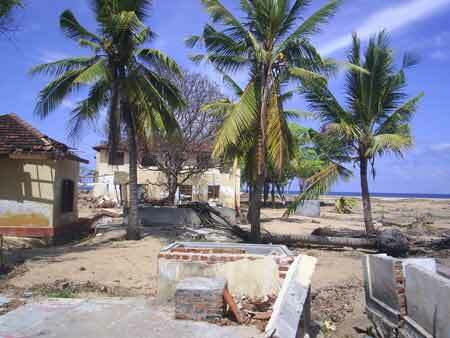 The entire place looked like a war torn area with devastation and destruction all over. The complex which was once was the sinasure of all eyes and having boasted of possessing the best campus in the whole Island now looked like a grave yard full of debris, mud, broken buildings, and fallen trees. Junior dormitory, once housed 50students, Kitchen complex with dinning rooms, and store room, office complex, library with well over 5000 books computer room, administrative block with its office complex all have got completely washed way. 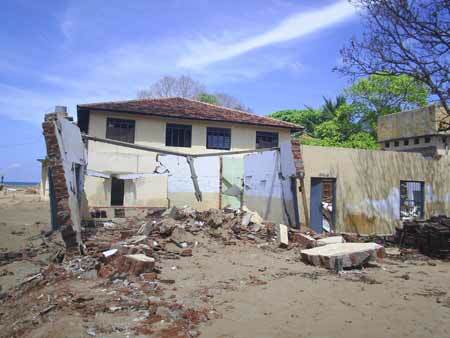 The entire boundary walls surrounding the 61/2 acre compound with its gates are no more. Extensive damages were caused to the doors and windows of both mosque and the lecture. Praise be to Allah lives of all the students and lecturers except the life of the Assistant cook.were spared.Innalillahi Waiin illaihi Rajioon.May Allah bestow on him the Jennathul Firdouse. In the said circumstances it has become almost impossible to reopen the College unless some immediate repair work is under taken. Therefore we earnestly request your assistance in the name of Allah to repair, rebuild and reopen the College as soon as soon as possible.